So another NaNoWriMo has come and gone and once again I DID NOT hit the 50,000 word goal. Le sigh. I’m disappointed in myself but realistic. Whenever I don’t feel like writing, I simply can’t make myself put words down. I tend to read as I write and edit along the way. I know that’s not the point of NaNo, but it’s how I write. I have to be in the zone, find my groove, feel my mojo working. Something. In November I had a gazillion things going on that had little to do with writing, plus a major release I did a piss-poor job of promoting. Somehow it still stayed on the publisher’s top ten list for two weeks. (My readers rock!) But, to be completely honest, I was a terrible writer in November. At least, I had no discipline whatsoever in November. I’m going to try to be better this month, which won’t take much, but with the holidays I don’t have high hopes. 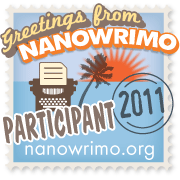 My goal is to finish my NaNo project this month so I can submit it shortly after the first of the year. But honestly, it probably won’t happen. I’ve also decided to be more realistic in my goals. I’m leaving that one because it’s doable if I buckle down. Others are going to go by the wayside. Previous Previous post: Let Your Voice be Heard!